It's time for another fantastic Creative Inspirations Paints challenge! This week, Marty challenged us to use our paints on acetate or acrylic. Be sure to check out the Creative Inspirations Paint blog to see all the creations that the DT has in store for you today! For my card, I painted some acrylic embellishments. The bird and the flower are CTMH. I gave them two coats of paint. The first coat was really sheer and pretty but you could see my brush strokes, user error, I'm sure. I wanted to cover up the brush strokes and have more coverage, so I waited until the paint dried and then did a second coat. The bird is painted with Tanzanite and the flower with Tutu Pink. The designer paper is Little Yellow Bicycle Clothesline. The lace is from my stash and the bling is Darice. The sentiment is from Ippity's The Simple Things. You can purchase this set from me HERE. This is so cute and just love your take on this challenge. Wonderful take on this weeks challenge, great layout too! 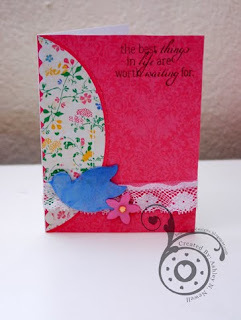 lovely card, great colors, the floral paper is fab and the little birdie is so cute! This is just beautiful! love the birdie and lace! Awesome sketch!